The work above is a modern representation of the Third Degree Tracing Boards of Masonic antiquity. It is filled with metaphor and symbolism, fluent to all master masons. Tracing boards were originally created as visual aids to illustrate the symbols and teachings of Freemasonry as conveyed within their corresponding degree. The allegorical and symbolic aspect is Western, and this interpretation has been adapted for the modern Freemason. Unique in this board is the story of the transformation of the neophyte through a progressive ascension through three spheres culminating into the space of the divine. The notion of these spheres comes from the alchemist Agrippa and his work from Three Books of Occult Philosophy, and they represent the earthly realm of man (materia), the celestial realm of angels (spirit), and the super celestial realm of the divine (soul). This third spheres is often referred to as the Monad. Important to keep in mind, this image is not a literal representation of past boards, but instead an interpretation of the culminating third degree of the tradition of Freemasonry. To learn more about The Master Mason Degree read Pike’s Master Mason degree from Morals and Dogma, or the Master Mason degree from Duncan’s Ritual and Monitor. 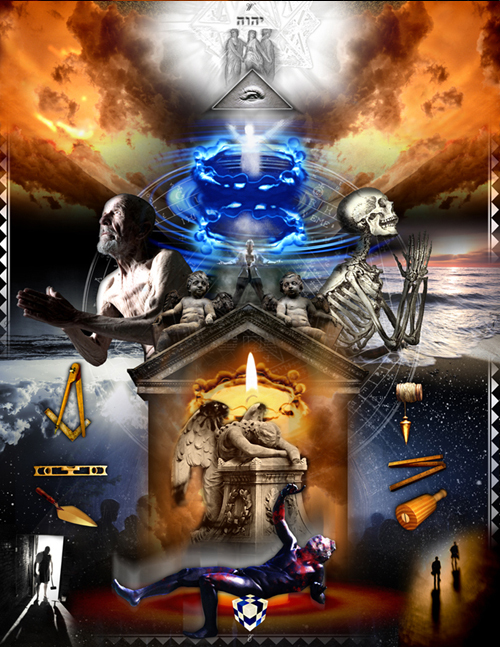 Interested in owning your own Modern Third Degree Masonic Tracing Board? You can find the First, Second, and Third Degree Modern Tracing Boards at Imagekind. Copyright – Freemason Information ©2008-14 All rights reserved. The image above may not be copied without the expressed written consent of it’s owner, Gregory Stewart, Freemason Information.